It is an understatement to say that Filipinos love karaoke. Almost every Philippine home has a karaoke machine or a Magic Sing microphone – a digital mic that turns your television into a karaoke machine. It’s almost always a feature at birthdays and holiday parties. And scores of bars and restaurants offer karaoke or videoke. When it comes to karaoke bars – laid back places to have a few drinks before embarrassing yourself publicly that have karaoke machines or a live band to back up your vocals. “Nightclubs” are basically strip clubs with karaoke, exotic dancing and back rooms that often feature more than just singing. The world’s first karaoke machine, the Juke-8, was built by Japanese inventor and musician Daisuke Inoue in 1971. But it is Filipino inventor Roberto del Rosario who holds the machine’s patent. He developed the Karaoke Sing-Along System in 1975. Since then, singing has become a central part of pop culture in the Philippines. Singing is the focus of several modern reality shows and game shows, and even Filipino celebrities like boxer Manny Pacquiao enjoy singing publicly. 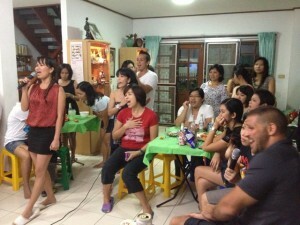 For the most part, though, karaoke is a family-friendly activity throughout the Philippines. Perhaps the best way to enjoy this tradition is in a Philippine home, but if you don’t know any locals yet, there are a many places to sing the night away. Enjoy!